Vegas is a funny place: I think you either love it or hate it. Some people visit time and time again, whereas others go once just to see what all the fuss is about and then never return. My friend, Alison, and I love it – which comes as a bit of a surprise to both of us because it is loud, expensive, over-the-top man-made/synthetic and neither of us gamble or party (well, okay, I do still party on the odd occasion but strangely enough, I never have in Vegas). But we do both like to shop (Alison far more than I), walk, eat and get all dressed up and go to a show, so that’s exactly what we did (again) on our recent trip. 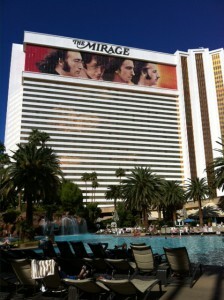 We stayed at the Mirage Hotel, partly because it was fairly reasonably priced, partly because it’s close to the Fashion Show Mall, partly because it has the theatre where Cirque du Soleil’s Love is staged (so not far to walk in high heels) and partly because…well, I’ll get to the fourth reason in a moment. 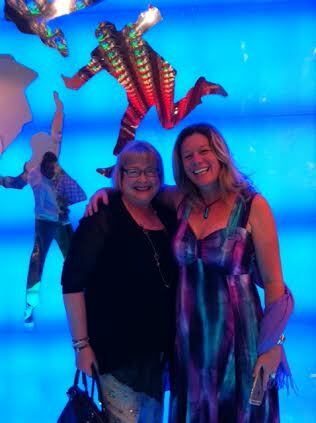 If you haven’t seen the Cirque show, Love, I highly recommend it. It’s set to Beatle’s music and is brilliant. I could watch that damn show five nights in a row and probably not get sick of it. Shopping-wise, the deal of the trip for me was a pair of uber-cool Steve Madden shoes…for $35! The shopping itself, however, wore me right out. By our third night in Vegas, we were both so flippin’ exhausted that we actually stayed the entire evening in our hotel room, chatting, watching TV, drinking wine and scarfing down popcorn and chips for dinner. Since I’m obviously in full-disclosure mode, I may as well confess that it was, in fact, the fish tank channel we were watching. Yes, that’s right: the fish channel. It’s rather like the log-burning channel (they had that, too) but the fish channel (ONLY at the Mirage) is live video footage (we think) of the fish and coral in the giant tank that’s behind the reception desk. Let’s just say that nothing overly fast or exciting happens on the fish tank channel – but the accompanying classical music is rather soothing. Then, on our last night, we went for dinner at the Italian restaurant, Rao’s, in Caesar’s Palace. Their mammoth meatballs are an absolute must, as is the Caesar salad and ravioli purses. Add in a basket-full of bread, a couple of salt-rimmed Caesar’s and a slice of cheesecake and after that, we pretty much waddled over to the Bellagio to watch the fountain show. 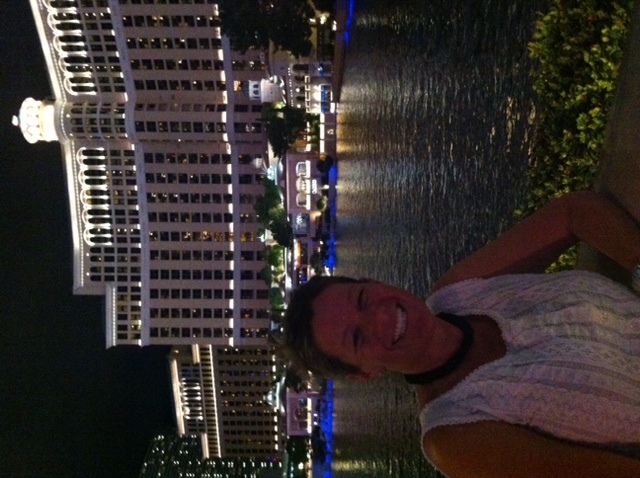 Watching the waters dance in front of the Bellagio Hotel is another favourite tradition of ours. We arrived just in time to catch the show set to Celine Dion’s My Heart Will Go On. But we forgot to do our Ocean’s Eleven thing, so stayed for a second song which was Time to Say Goodbye by Andre Bocelli – after which, Alison and I re-enacted the end of the Ocean’s Eleven movie where she slips off in one direction and I go off in the other. This cracks us up every time. At any rate, we had a fun few days. My one ear is still plugged and Alison’s leg is still sore (possibly a shopping-related injury but who am I to say) but hey, a trip to Vegas wouldn’t be complete without a few unexplainable ailments. 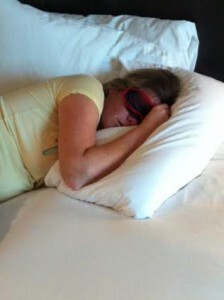 No, our Vegas experience wasn’t quite the same as The Hangover movie but perhaps that’s a good thing. Which brings me back to the What Happens Here, Stays Here ad campaign. 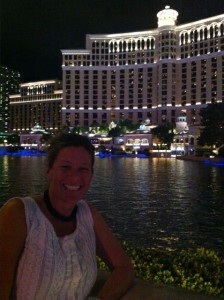 For there is far more to my love of Vegas than merely what I do there – or who I am there. 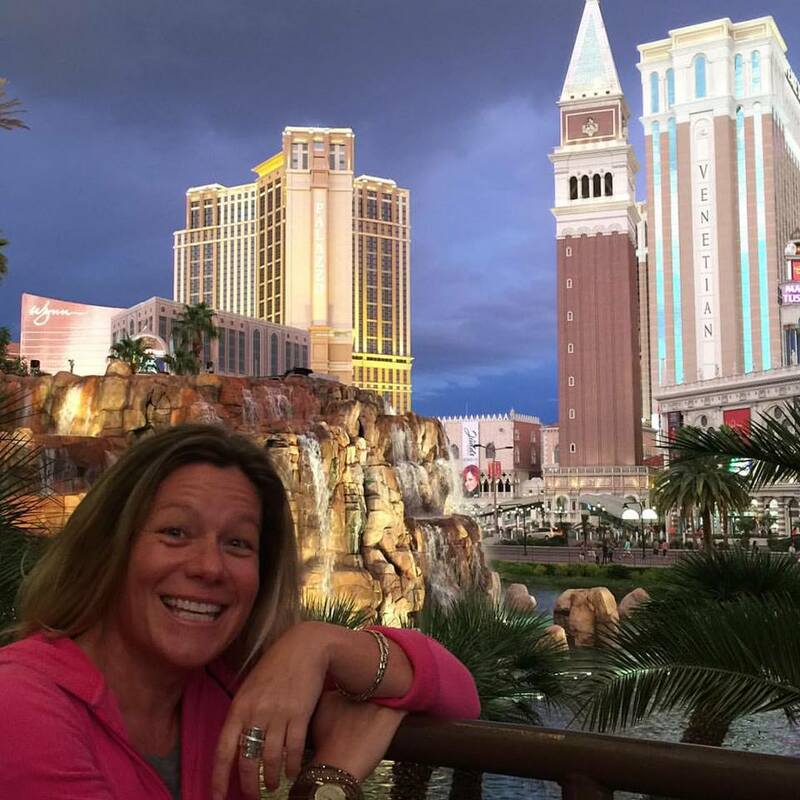 “The emotional bond between Las Vegas and its customers was freedom. Freedom on two levels. Freedom to do things, see things, eat things, wear things, feel things. In short, the freedom to be someone we couldn’t be at home. And freedom from whatever we wanted to leave behind in our daily lives. Just thinking about Vegas made the bad stuff go away. 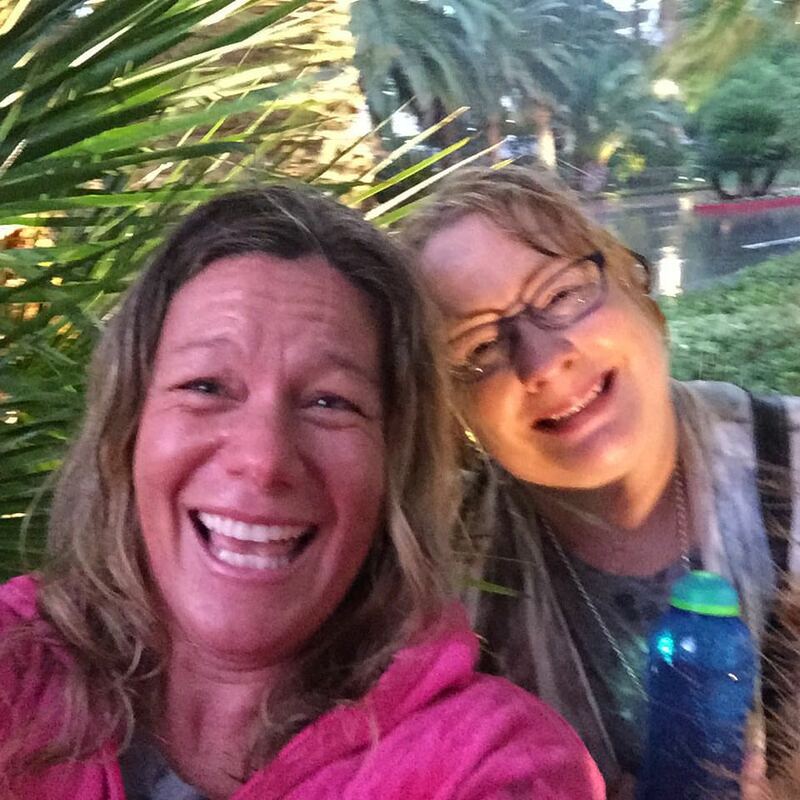 So although what happens in Vegas is supposed to stay in Vegas, since I have already broken this rule with the fish channel confession, I may as well share with you a story from a previous trip to Vegas…and you can take from this what you choose. Just over fifteen years ago, my husband, John, and I went to check-in at the Mirage Hotel – in front of the huge fish tank – but our credit card got declined because the rental car agency had put a hold on additional funds. A quick call to the credit card company sorted that out and away we went. Ten days later, he was gone. If you’ve read my book, A Widow’s Awakening, you may recall the passage where I went to see him at the funeral home. He was lying on a stainless steel gurney, covered in a white sheet, and at the top of his chest I could see part of the incision from his heart removal surgery. I debated about pulling the sheet down to take one last look at the chest of the man I loved so much. 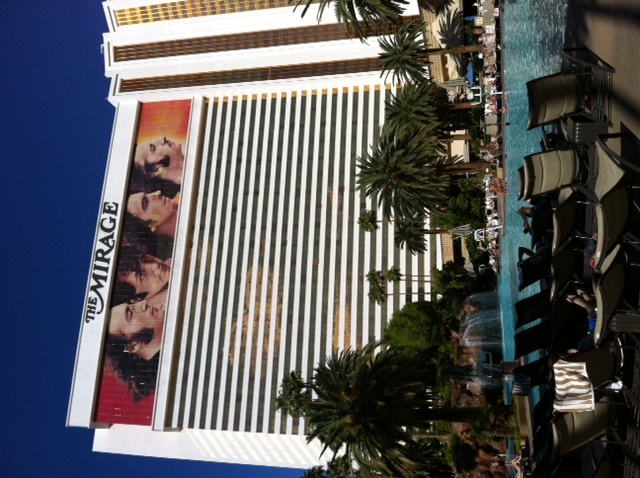 But then I thought back to our special time in Vegas – for the Mirage would end up being the last place we made love – and decided no. I wanted to remember John’s chest as it was when he was alive and happy…not as the exit point for his beautiful heart. So for me, I don’t go to Vegas to escape my life. I love my life now – I have no need to escape it. And because of John’s on-duty death, I have the financial freedom to do the work I wish to do and live where I want to live…and for that, I am eternally grateful. Nor does thinking about Vegas make all the bad stuff go away. In fact, Vegas brings back what were once some pretty painful memories. But perhaps that’s partly why I love to go there so much? Having loved and lost and learned how to be happy again on my own, it has become the perfect place for me to check in with myself on the big question: am I happy? Funny…as artificial as Vegas is, it has become my reality check. Perhaps it won’t come as a surprise that Alison, too, is a widow – and she and her husband also had some wonderful times together in Vegas. Her husband passed away six months after John did – and over the years our friendship has grown from sharing our journey through grief to having fun and doing some traveling. If you are a fan (or foe) of Vegas, I’d love to hear about your experience…I think! 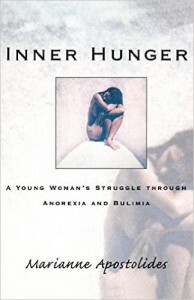 I recently read the book, Inner Hunger; A Young Woman’s Struggle Through Anorexia and Bulemia, by Marianne Apostolides. The book was published in 1998 – and given to me in 2004 by the author’s aunt (a friend of the family). Then it sat on my bookshelf for more than a decade. I’m not sure why I put off reading it for so long but when I finally got around to reading it a few weeks ago, I could barely put it down. I honestly had no clue about the horrific inner struggle a person faces when he or she is dealing with an eating disorder. Now I have a better idea. And frankly, it sounds like a terrifying, frustrating and lonely journey – especially for a young woman just starting out on her life path. As a teen, Apostolides found that the seemingly best way to control her thoughts, feelings and life was to control her intake of food – be that vastly limiting the intake of food (anorexia) or consuming enormous quantities of it (bulimia). Inner Hunger is an extremely candid account of the author’s personal experience with eating disorders and the hell she went through trying to become healthy again – physically, emotionally, psychologically and spiritually. For, as the title suggests, Apostolides wasn’t just dealing with an extremely unhealthy relationship with food, she was unsuccessfully trying to feed an inner hunger with an external substance – food – that could never satisfy what she was so desperately lacking in herself. Obviously, Apostilades is not alone in her struggle. According to The Emily Foundation (US), 1 in 5 women struggle with an eating disorder or disordered eating – and 90% of those are between the ages of 12 and 25. Eating disorders are a significant issue that are not going away any time soon. Although I don’t have any sage advice or personal experience to share on the subject, I know an expert who does: Esther Kane, Registered Clinical Counselor and author of the excellent book, It’s Not About the Food; A Woman’s Guide to Making Peace with Food and Our Bodies. If you know of someone who might be struggling with an eating disorder, Esther’s article, How to Help Someone with Disordered Eating, is a highly informative and helpful read. Maryanne Pope is the author of A Widow’s Awakening, the playwright of Saviour and the screenwriter of God’s Country. Maryanne is the CEO of Pink Gazelle Productions and the Chair of the John Petropoulos Memorial Fund. 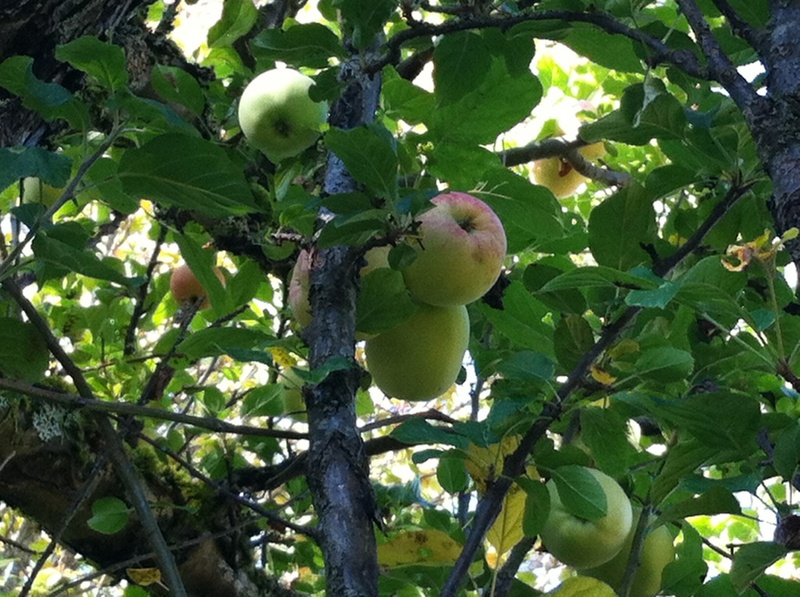 If you would like to receive Maryanne’s weekly blog, sign up here. Well, September is certainly upon us. I could practically feel the collective shift in energy yesterday as people left the (hopefully) lazy days of summer and returned back to the structure and (hopefully not) stress of work and/or school. 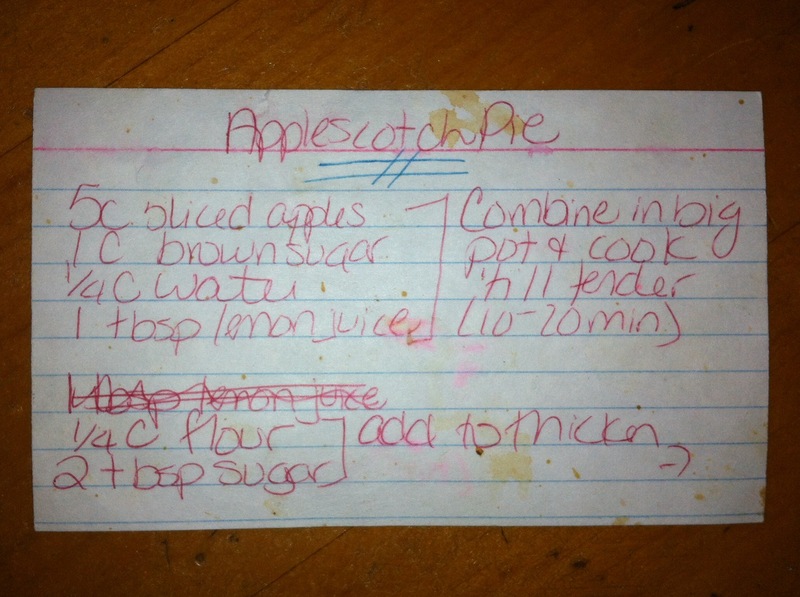 In honour of my dear friend, Heather, whose birthday it is today, I would like to share with you an apple pie recipe she shared with me years ago. 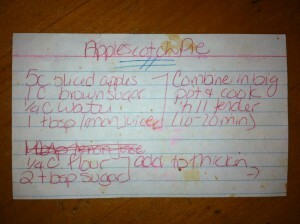 As you can see by the butterscotch stains, this is a favourite of mine. 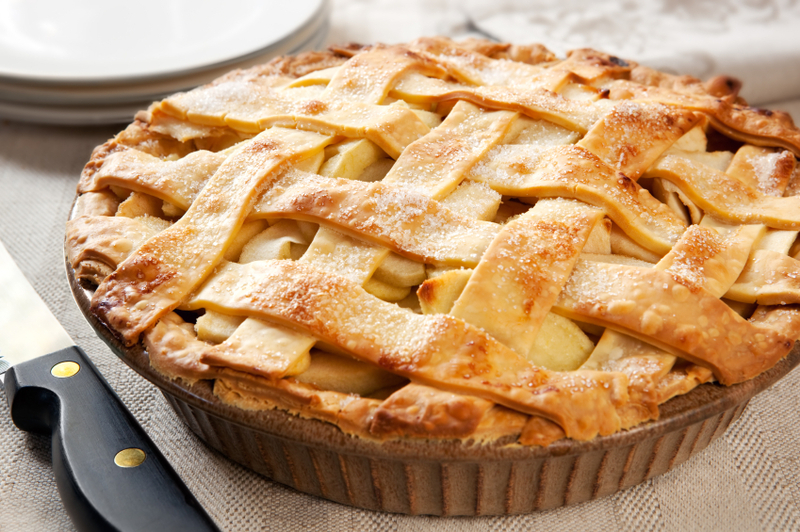 In fact, baking (and eating and sometimes even sharing) this pie has become an annual September ritual for me – especially since I now have very happy apple trees in my backyard! Pour into pie shell (lattice-top is best) and bake at 425°C for 40-45 minutes. Enjoy! Maryanne Pope is the author of A Widow’s Awakening and the upcoming book, Barrier Removed; A Tough Love Guide to Achieving Your Dreams. Maryanne also writes screenplays and play scripts, including the play, Saviour. She is the CEO of Pink Gazelle Productions and the Chair of the John Petropoulos Memorial Fund.